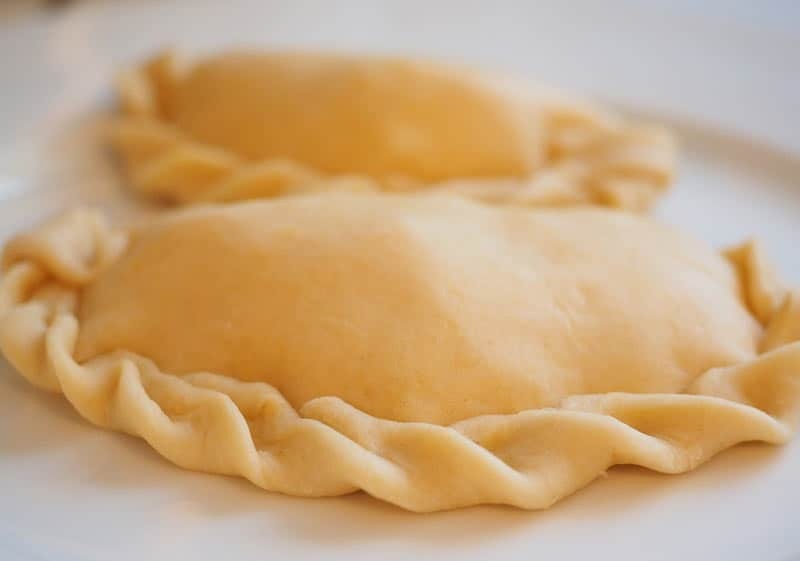 Handmade empanadas make fantastic comfort food. Their crispy and flaky exterior and steamy meaty interior checks a lot of boxes on the comfort food list. 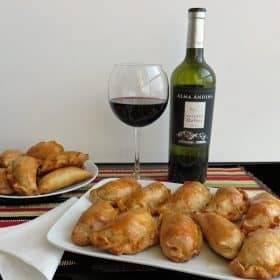 There are many types of empanadas being made throughout South America and Spain, but the ones we’re making today are our own version, which are really just a combination of the best bits from all of the empanadas we’ve had. 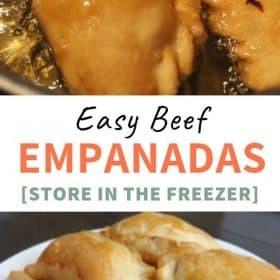 These empanadas can be made with whatever ingredients you have readily available in your kitchen, which makes them very versatile and easy to make. You’ve likely had a few different types of empanadas. 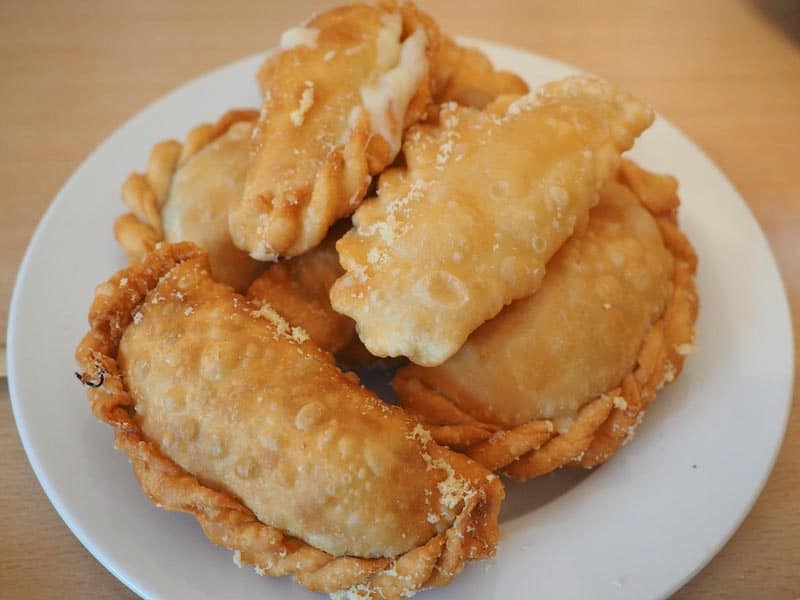 The traditional variety made in Argentina are baked, unlike the ones in Colombia, which are fried. 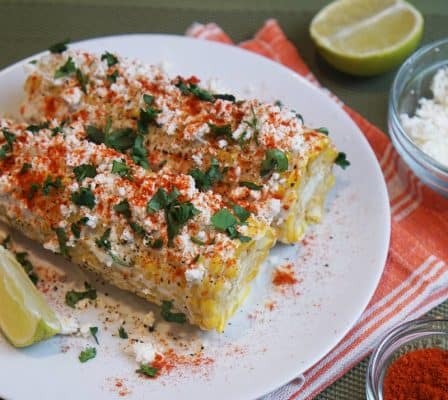 The two also use a different type of dough – one a flour pastry and one a corn pastry. Ingredients vary as well. In some parts of Spain, it’s not uncommon to find seafood like mussels baked into their pie-like empanadas. 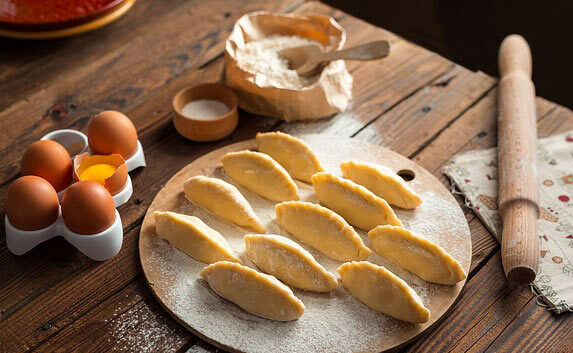 In Argentina, you’ll find hard boiled egg slices in the empanadas. They are called Empanadas mendocinas. 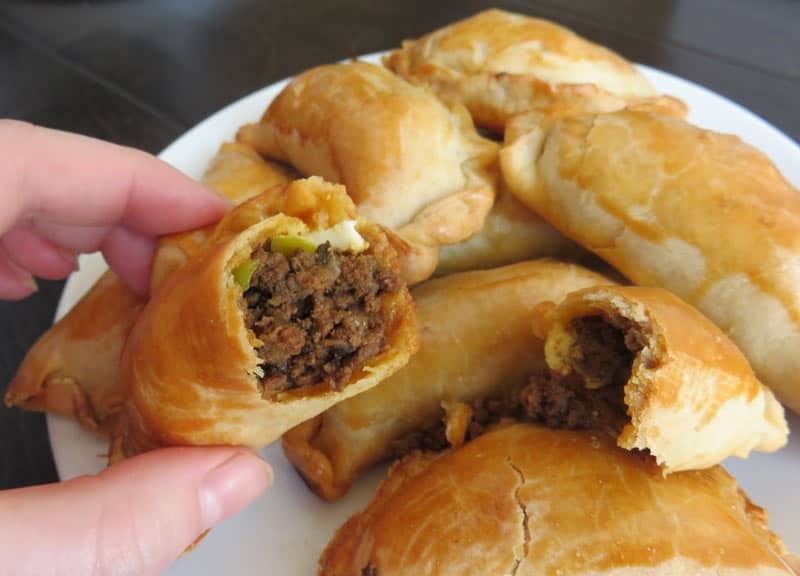 The thing with empanadas is that you can really make the filling out of anything you like. Why are empanadas so well loved around the world? I mean, you can find them in some variation in just about every cuisine in the world. It’s likely because they are so easy to eat. They’re essentially a hand pie, which you can grab and eat on the run. They’re also just so darn tasty! For me, comfort food has to be something you crave, that is simple, and incredibly satisfying. Empanadas are all of those things. They are hearty and filling too. So why not try your hand at making your own at home. They really aren’t that hard to make. 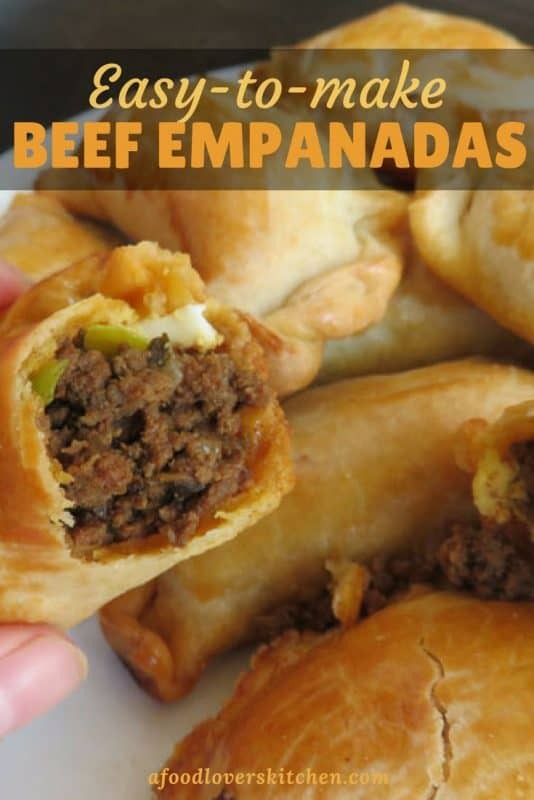 Your empanadas can be meat filled or vegetarian. We like to put ground beef into our filling, along with onions, potatoes and plenty of tasty spices, like cumin, chili powder, and paprika. You could put chicken, pork, or fish in yours, if you like. Root vegetables also work as a filling – try pumpkin, butternut squash, or turnips. It’s your choice whether you make the dough yourself or buy it pre-made. You can find pre-made dough in just about any major grocery (often found in the frozen aisle with the pie dough. A Latin or South American grocery will definitely have them. If you can’t find it already cut into circles, you can always just buy pre-made pie dough and cut the circles yourself. It’s also super easy to make, so don’t shy away from making it yourself. All it takes is flour, egg, butter (or lard), milk and salt. You’re probably thinking there’s no way these can be easy to make, but you’re just not extending enough faith. Don’t worry if you aren’t a pro at making cute little parcels out of the dough. They don’t have to be pretty. They just have to taste good! 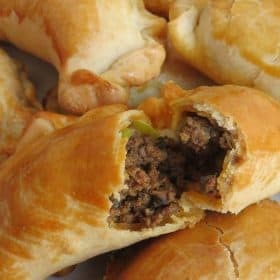 In fact, you don’t have to make your empanadas in any pre-defined shape. As long as the dough holds in the ingredients, that’s all that matters. If you want to make it really easy, buy one of these empanada presses that do all the work for you. 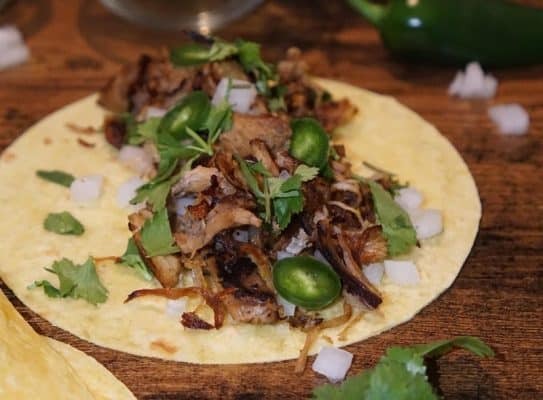 All you have to do is fill them with ingredients and press them together. To get started, get your dough ready. If they’re store bought, there’s nothing to do but set them out. If you’re making the dough, just combine the ingredients, mix it into a dough ball, roll it out, and cut out round shapes. Very simple. 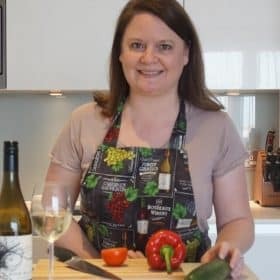 To make the filling, decide on the ingredients you want to use, then prepare them all, either together or separately – they’ll all come together in the end, so why not save some washing up and just use one pan. 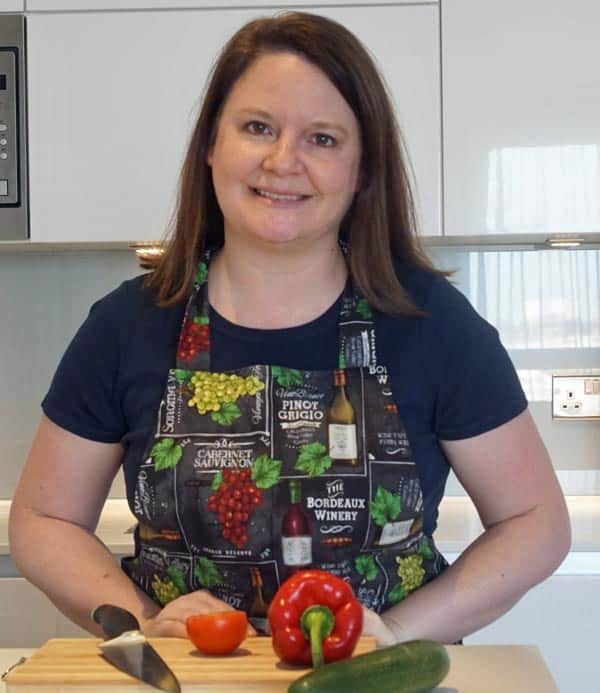 For my filling, I’m using the ingredients I listed above – ground beef, onions, potatoes and spices. I pre-cook the potato and then cut it into little baby cubes. Sweat the onions, brown the meat, add the spices, mix in the potatoes, and DONE! Now just scoop some filling into the dough, fold over the dough, and crimp the edges together. You might need to put a bit of water along the inside seam to hold it. The only thing left to do is bake or fry the empanadas. Baking them is definitely easier, cleaner, healthier, and less fuss. But fried empanadas are oh-so-tasty. It’s up to you. I’ve made them both ways. 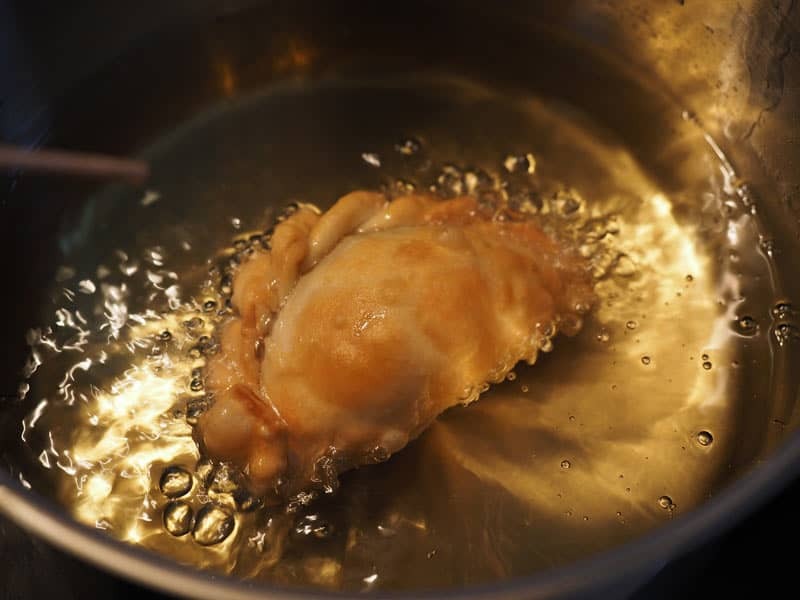 If you choose frying, you’ll need a large enough vat of vegetable oil or lard to submerge the empanadas. If you choose bake, put the in the oven at 350 for about 10 minutes, until they are browned on the top. 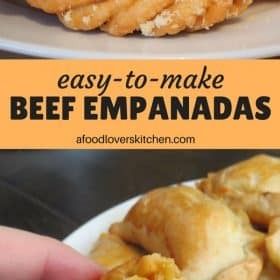 These easy-to-make beef empanadas are so close to the real thing, you'll feel transported to Argentina in one bite. 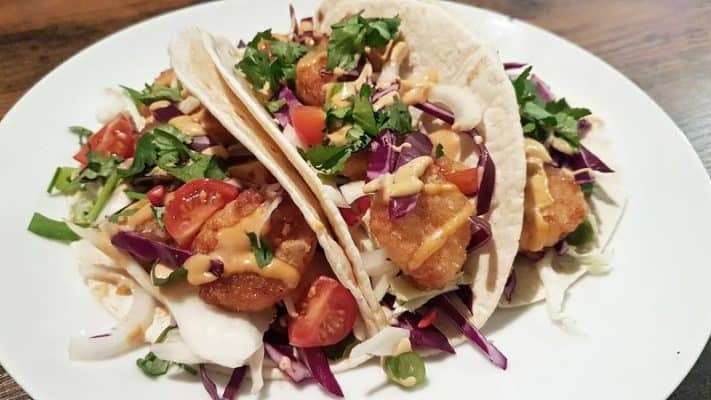 They do require some time to make, but they're delicious. Make a lot and freeze them. Cook the potato either in the microwave, oven or by boiling. Cut it into small cubes. Add chopped onions to a skillet and sweat over medium-low heat until translucent. Add the ground beef and cook until browned and crumbled. Add the paprika, cumin, chili powder and salt. Stir to combine. Add the potatoes and stir together. Add a spoonful of the mixture to the dough rounds. Fold the dough in half over the filling and crimp the edges together. Bake at 350 F for 10 minutes or until browned on top. Add the flour to a large mixing bowl. Cut the butter into small cubes and add to the flour. Cut in the butter until the flour mixture resembles small pebbles. Add the egg and milk. Stir to combine. Using your hands, knead the dough together until dough is smooth. Roll out the dough on a floured surface. Cut the dough into 4 inch rounds.